The hum and thrum of insect wings is not reserved for the outdoors, apparently. One of this year's biggest trends in spring fashion and beauty is the humble but mighty bumblebee. This was not so much a proclamation by some style czar, as it was an observation on my part while getting our beautiful Anthropologie store in Toronto ready for spring: bees, bees everywhere! I've selected a few bee-autiful things from our store for your perusal. Clockwise from top left: The Twill Honeybee Blazer; thanks to the late Ms. Winehouse, beehive hairdos are back; Honeyed Life Shirtdress; Honeybee Cargo Shorts; yummy honey treats. A closer look at some of the bee details. Click to enlarge. 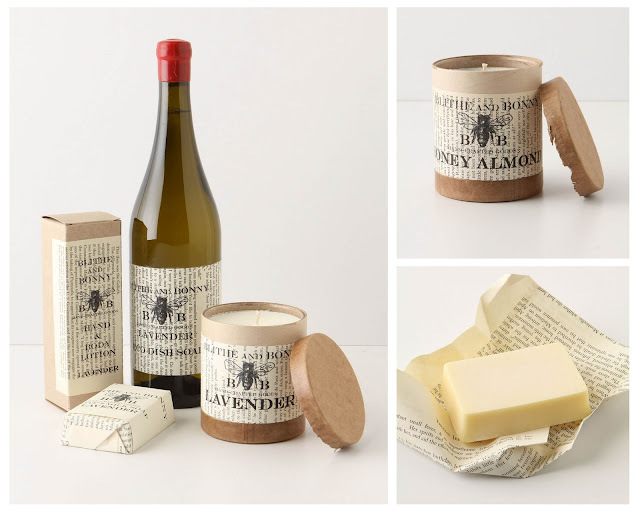 One of my favourite brands that we carry at Anthropologie is Blithe and Bonny, a homegrown line of scented soaps and candles created by a couple from Bonny Doon, California. They make delicately scented soaps, creams and candles that forego chemicals in favour of natural ingredients. Shown above: hand and body lotion in lavender, natural and biodegradable dish soap in lavender, lavender hand and body soap, lavender and honey-almond candles using soy wax, natural scents and a lead-free wick for 40 hours of clean burning loveliness. These all-natural, handmade beeswax candles by Pollen Arts were formed into the shapes of nostalgic jars. 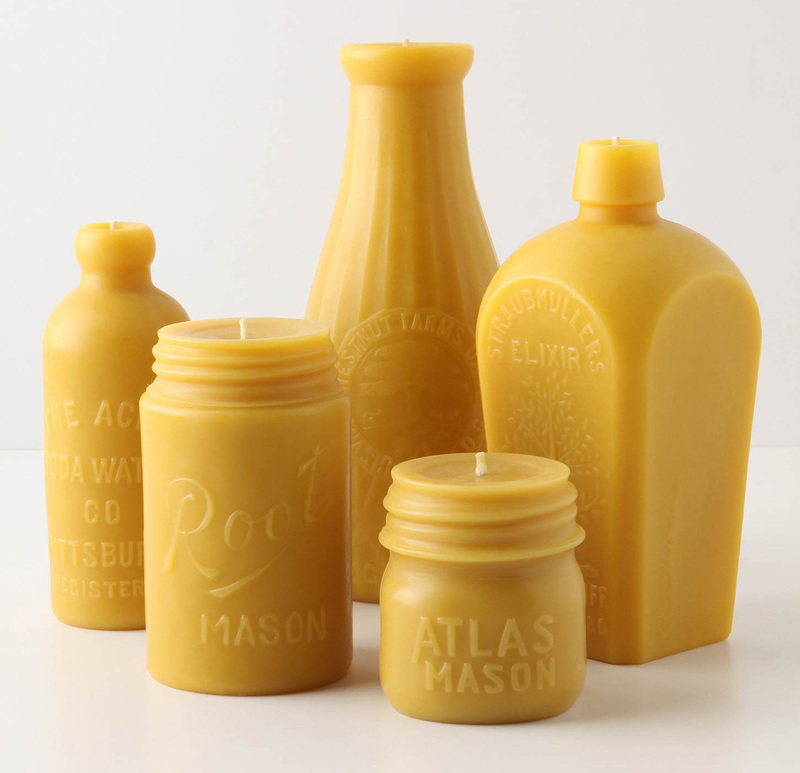 They are made of pure beeswax and burn clean with the very delicate scent of honey and nectar. 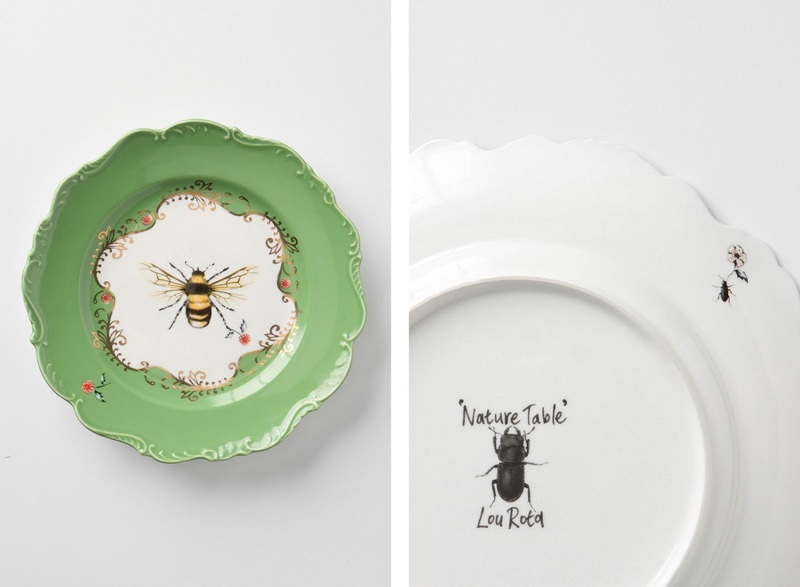 The Natural World dessert plates were designed exclusively for Anthropologie by artist Lou Rota and come in four different colours and patterns, including bumblebee (shown above) chameleon, hummingbird and beetle. I love the vintage-inspired curves and the bright colours of these plates. I have all four! Post-Script: Our fascination with honeybee culture dates back centuries. Not only are we smitten by the insect's lucrative crop of honey but we are also taken by its symbol of strength. We find comfort and kinship in the honeybee social hierarchy because it has similarities to our own: a community of workers with a common goal in mind. The use of bee imagery has been prolific throughout history, used by many ancient civilizations as a symbol of matriarchy, fertility and labour. Even Martha has used the image and ethos of the honeybee with her Martha By Mail logo. Let's hear it for bees! I have the Bee Blazer and I LOVE it!!! One of my favorite shops on Regent street in London. Love their Naturally scented candles, have them around my homes. Beautiful dessert plates, love the design and bright colors. I love your post on Looking Back to Move Forward: Vol I, and I totally agree with you. It is a pleasure to read your posts. Rowaida, The Regent Street store is an incredible space! We're opening a third store here in Toronto in a town called Oakville this spring. It's going to be in a building that used to be an old bank. I'll have photos!